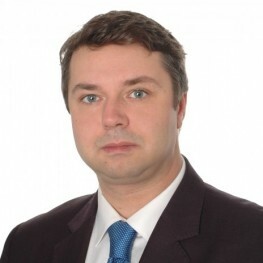 Tomasz is graduated from International Relations at Collegium Civitas, specialisation: Diplomacy and postgraduate studies in the field of Security Analysis and International Threats. Scholarship holder of the University College of London (2002). Member of the International Institute for Strategic Studies in London. Working at the Euro-Atlantic Association (currently as a member of the Executive Council) since 2004. Chairman of the student delegation to NATO Istanbul Summit in 2004. Intern at the political department of the Embassy of the Republic in Poland to the Federal Republic of Germany. Participant of the European Union Monitoring Mission during presidential and parliamentary elections in Ukraine in 2004 and 2006. Co-organiser of the 10th anniversary of Poland’s accession to NATO. Advisor to the Casimir Pulaski Foundation and the National Centre for Strategic Studies. Vice-president of the Institute for Research of International Relations. Professionally involved in the Polish arms industry.